Zuca is a unique concept in bag design where you can mix and match durable insert bags with colored aluminum frames for a unique look that matches your personality and style. Inspired by aerospace technology, this durable aluminum frame redefines what a travel bag can be. It gives you a lot of cool and convenient features but one overall is worth every penny - a seat! 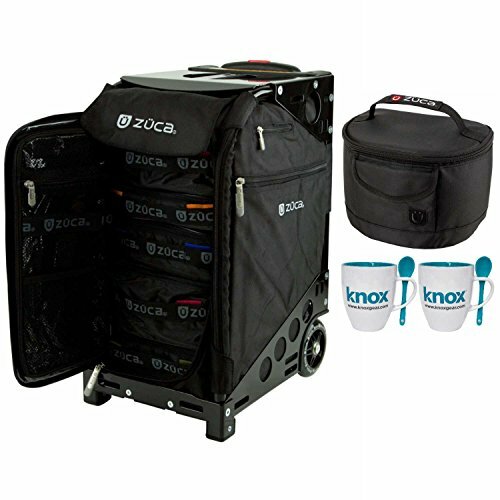 Zuca Pro Insert Bag w/ Sport Frame (Black) & Utility Pouches, Travel Cover: 39.5" Telescoping Handle | Top Platform Seat - supports up to 300 lbs. Zuca Lunchbox (Shadow): Designed to complement the ZUCA rolling prduct line by fitting neatly on top of the seat. Attaches securely to the telescoping handle.| Smartly styled with a black band on top and bottom. High-tech aluminized heat shield helps keep stuff hot or cold.